bittersweet. – animal crackers on the couch. I slowly folded the rainbow striped party hat in half and stuck it in Jack’s special ‘safe keeping’ box. I later added the cake topper from his very first birthday cake. a banner that read ‘JACK’. for some reason this small act was the saddest moment of our baby boy turning one. not because the party was over, the hat been used and the cake eaten. but because I knew the next time I looked at that hat, that little boy wouldn’t be so little. I could sense the nostalgia I would feel. I could forsee the grown little boy. The momma going back through the box, the distant memory of a first birthday, a crinkled rainbow party hat-faded but still as vibrant as ever in my eyes. maybe I will make him wear it again, when he’s grown. just to humor me. his chubby cheeks will probably be gone. his translucent, soft baby skin will be darker. mottled by years of the sun. first shaves. who knows what his hair will look like. he will be tall. probably like matt. but his eyes will still shine. they will still hold that eternal glee of joy that they have for a year and a day now. and no matter how old he is, I will see those eyes, and I will see my baby boy. 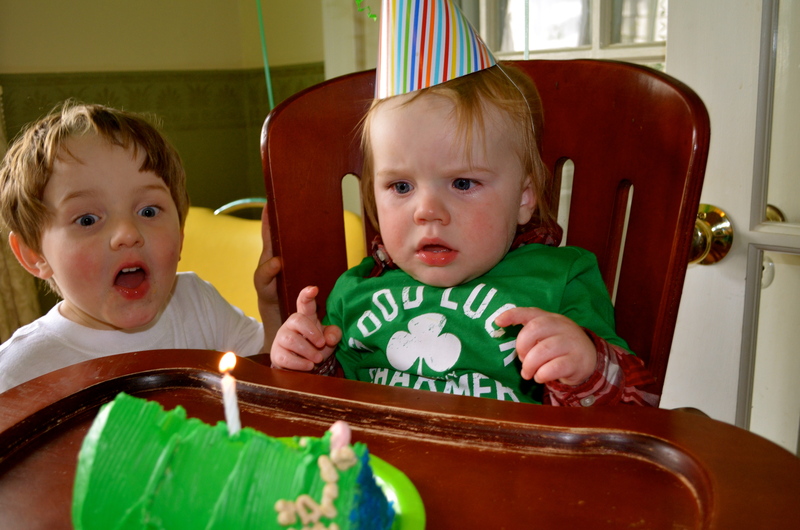 Posted on March 20, 2012 by stibbsfamily	This entry was posted in daily life, thoughts and tagged baby first birthday, Birthday, Birthday cake, birthday hat, Candle, Children, first birthday, rainbow birthday. Bookmark the permalink.